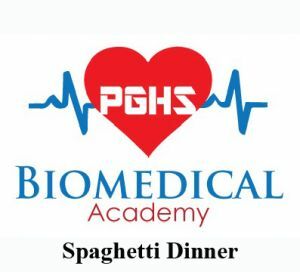 Support the PGHS Biomedical Academy and let us make dinner. Academy and non-Academy members can order in just 3 easy steps below. The dinner includes enough to feed four people: spaghetti in marinara sauce (with or without meat), salad, rolls, and dessert. 1) Complete the online order form by copying the link below by Friday, March 1st to reserve a spaghetti dinner. 2) Pay for your meal here at the webstore. 3) Pick up your meal after the PGHS Freshman Parent Night meeting on Wednesday, March 13th between 5 & 8 PM on Schoolloop Road in front of PGHS Multipurpose Room.